If you are looking to enjoy SiriusXM™ Radio in your factory installed vehicle stereo look no further than our OEM bundles. Our bundles work with all major vehicle manufacturers including Toyota, Lexus, Land Rover, GM, Ford, Honda, Subaru, VW, Alfa Romeo, Dodge, Chrysler, Fiat, Jeep, Mercedes, Nissan, Porsche, Hyundai, and Mazda. Our OEM Factory Radio Bundles are Design for the Vehicle! Use the factory controls on your Harley Davidson motorcycle to listen to SiriusXM™ Radio service. Our kits work with the 2014-2019 Road Glide, Street Glide. and Electra Glide models with the Boom Box 4.3 and Boom Box 6.5GT. Browse categories and channels and use presets to enhance your ride while listening to SiriusXM™ Radio service. Specifically Designed for Harley Davidson Motorcycles! 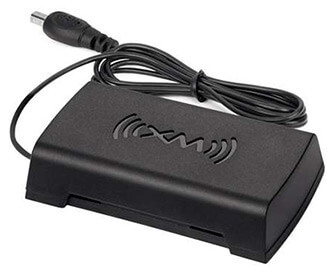 The SiriusXM™ OnyX EZR is the latest portable satellite radio receiver to hit the market. It features a crystal clear display with easy to use directional button on the front of the receiver and is one of the most feature rich receivers SiriusXM™ has released. 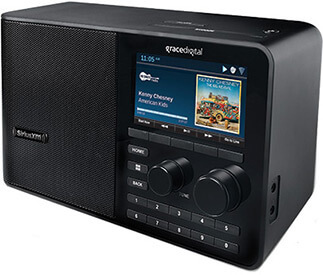 The receiver features SiriusXM™ Radios unique TuneSelect™, One-Touch Jump™, and TuneMix™ to enhance the listening experience. Buy one today! You won't be disappointed. The OnyX EZR Can Go Anywhere! 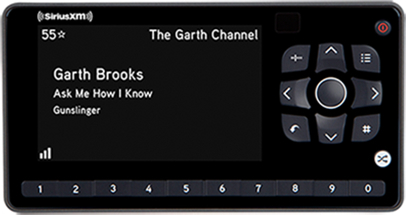 If you are looking for a SiriusXM™ receiver with a full color screen then the OnyX PLUS is the satellite radio receiver for you. The OnyX Plus features a crystal clear full color display with simple to use preset buttons on the front of the receiver. The OnyX PLUS is the top of the line receiver and offers such as TuneSelect™, One-Touch Jump™, and TuneMix™ to enhance the listening experience. You can also store up to 20 of your favorite channels for one-touch access to your favorite programming. Listen in style with the OnyX PLUS receiver. The OnyX PLUS Can Go Anywhere! This sleek and streamlined receiver is a carry over from the original Sirius Radio days and is perfect for those who want simple features at a budget price. The Stratus 7 has large buttons to change channels along with a 10 channel presets. It has a clear blue display with large text to view song title, artist, and album. The Stratus 7 also offers parental controls and the ability to filter by category. If you are looking to get SiriusXM Radio on a budget and still have basic features then the Stratus 7 is the receiver for you. The Stratus 7 Can Go Anywhere! The AGT Sportscaster™ Can Go Anywhere! 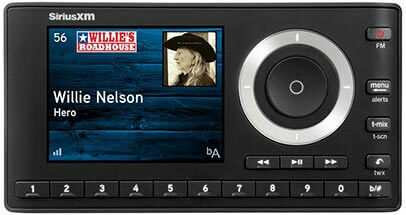 The CommanderTouch is the only dash mount SiriusXM­™ Radio receiver on the market today. It has a beautiful, full-color display and features pause and rewind capability, along with album art on a compact display. The receiver is also equipped with TuneStart™, TuneMix™, and many other features. It provides a factory grade installation with a modern look and high tech features. The CommanderTouch™ includes the complete flush mount kit, hardwired power harness, hardwired FM modulator, magnetic antenna and audio cable. The CommanderTouch™ Can Be Used in Applications! The TTR2 is a one of a kind internet streaming speaker system with a built-in SiriusXM™ Radio receiver. 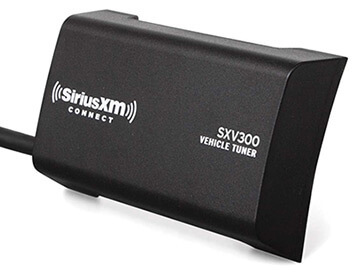 The SiriusXM TTR2 is the only SiriusXM receiver that allows you to listen to SiriusXM online from anywhere with an Internet connection. The TTR2 is a small unit with great sound and sleek design. It features a high quality speaker, wireless connection, 10 channels presets, and more. Installation is simple and only requires internet connection via Wi-Fi or Ethernet connection. No antenna is required to get SiriusXM online service. The new TTR2 will feature the ability to pause, rewind, and listen to on-demand shows. The TTR2 Can be Used in the Following Applications! If you have an aftermarket stereo such as SONY, JVC, Kenwood or other stereo system and you want to listen to SiriusXM™ Radio service you will need this tuner. The SXV300 offers several feature including Connect & Control, Xtra Channels, Pause and Rewind, and much more. Be sure to check your stereo for the SiriusXM™ Ready logo to ensure that your stereo is compatible. We Have Put Together Some Unique Bundles with the SXV300! If you have been looking to get SiriusXM™ Radio service via your home stereo tuner such as Kenwood, ONKYO, SONY, and others then this is the tuner you need. Change channels, categories, and store presets with this tuner connected to the back of your stereo system. Please note that your stereo needs to have the XM Ready logo on the front panel of the stereo. The XHD2H1 Only Works with Home Stereo Systems.